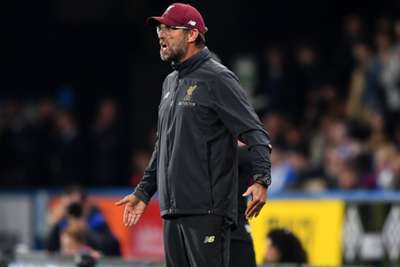 Liverpool manager Jurgen Klopp used a surprise dog analogy when assessing his team's change in approach this season. A goal from Mohamed Salah was enough for Liverpool to keep pace with Premier League leaders Manchester City thanks to a 1-0 win at Huddersfield Town on Saturday. The victory once again showcased a far more stable Liverpool outfit, who kept their sixth clean sheet in nine league games this season. Klopp discussed his team's approach, which has been far less reliant on the high press so far this campaign. "Last year, our big strength was high pressing, and then when the opponents didn't play football, it was like, 'Sorry'," he told UK newspapers. "It's like a dog. If you don't give him his favourite toy and throw something else, he thinks, 'No, I don't want that. I want the other one. I want to play high press'. "So, that's how you develop, step by step, doing different things. Now we have to be better in the midfield press. Our midfield press wasn't our problem against Huddersfield, though. Our problem was only that when we had the ball, we could have done better." With only three goals conceded, Liverpool share the league's best defensive record with City – the two teams two points clear at the top. Klopp, whose side host Red Star Belgrade in the Champions League on Wednesday, said there were still areas of improvement for his team. "You cannot win only with offensive football, it's not possible. Because you are open and the pitch is too big for that," he said. "You need to be organised and, on the other side, you need to create. I would love to see us do that a little bit better."